TITANIA INGLIS / NEWS: New collection! Finally, time to share what I've been working on all this time! 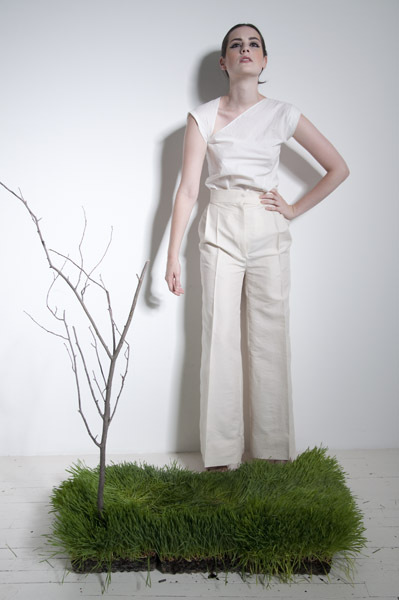 Here's a little preview of the new looks for Spring 2011; there are lots more photos in the lookbook (PDF version downloadable here). This season, I've been playing with bias cuts and origami folding; I was toying with calling it the "Almost Zero" collection since I was experimenting with the idea of zero waste cutting, though none of the pieces got all the way there. 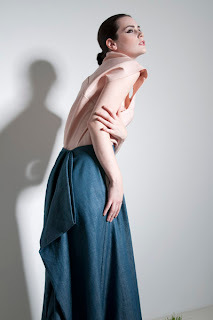 Fabric-wise, I found a lovely new Japanese denim — organic cotton dyed with natural indigo. Thought it would be a challenge to design a long denim skirt that looked modern; you can judge the results for yourself! My other favorite fabric of the season was an Italian twill in a silk-organic cotton blend; though I usually avoid blended fabrics, which are less recyclable, the sculptural possibilities of this one were just too tantalizing to pass up. In the lookbook photos, I've used it in the cocoon top, reverse dress, and superwide pant. Photos by Evan Browning, model Sam Mae, makeup by Allie Smith. I want the Reverse dress! Brilliant and beautiful!